The stock markets took a breather last week. Earnings season has been a mixed bag. In some cases, future guidance was more important than beating expectations. The 2018 performance review posted during the week; you can check it out here. 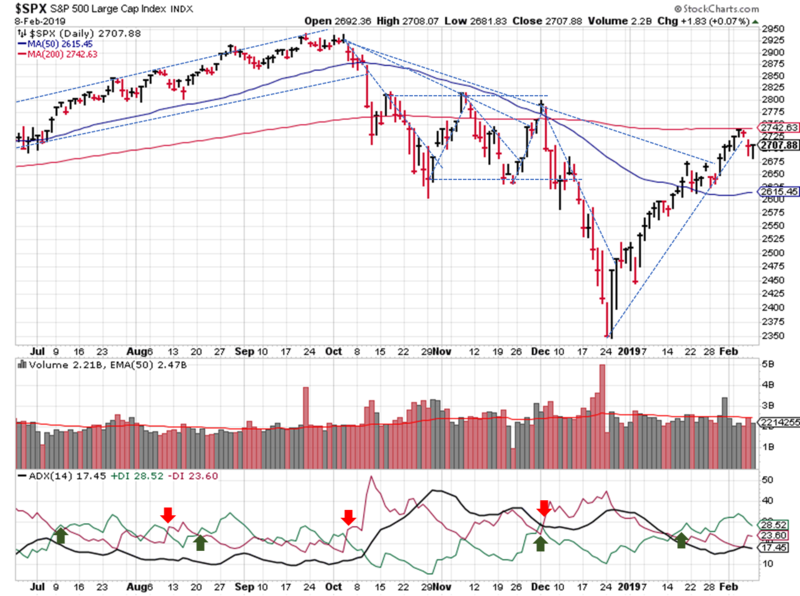 The biggest change, from a weekly post perspective, is the switch from 50-day moving averages to the ADX directional indicator. In the weekly view, the S&P ($SPX) basically ended where it started after running into resistance at the 200-day / 40-week moving average. 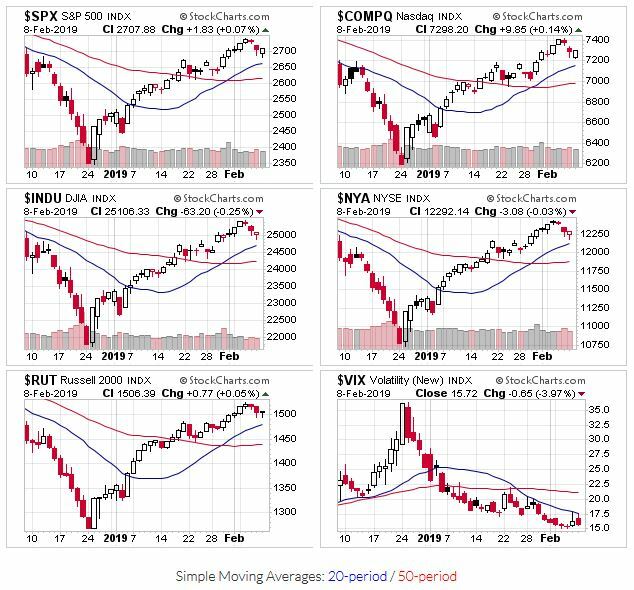 Even though it didn't close at the highs for the first time in several weeks, there still isn't a higher "low" to use for drawing the new uptrend. Switching to a daily view, the bounce lower from the 200-day moving average broke the tentative uptrend I had drawn. 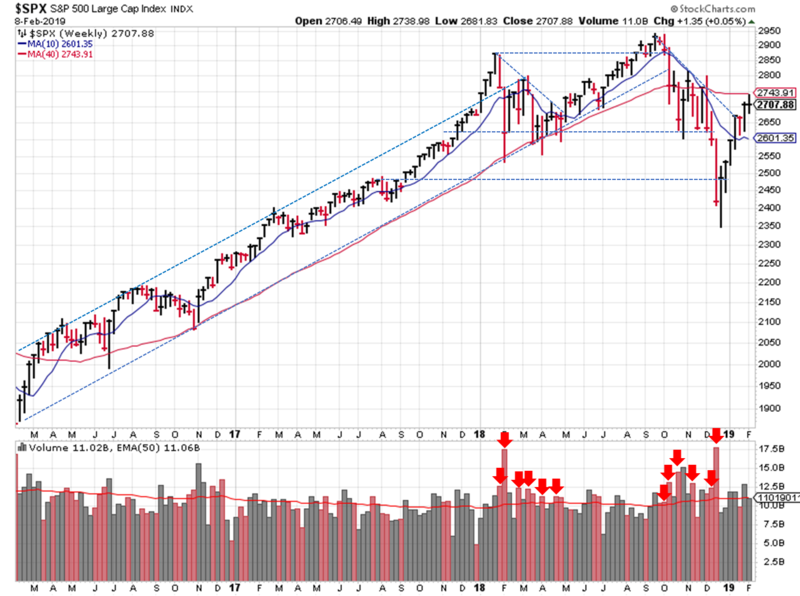 Now we wait for signs of support...I'd guess the mid-2600's...or the 50-day moving average by the time prices get there. The DI+ / DI- continues to show a bullish environment. In support of the signal adjustments made in the 2018 performance review, the DI cross-overs (uptrend/downtrend signals) are now overlaid on the daily chart. No change in price/volume; still in rally mode (above the 50 day moving average, limited institutional selling). OEW also remains in uptrend mode. The U.S. stock markets have made an impressive bounce off the late December low, so a brief pause / consolidation is a good thing...fingers crossed this uptrend/rally isn't just a big bull trap!